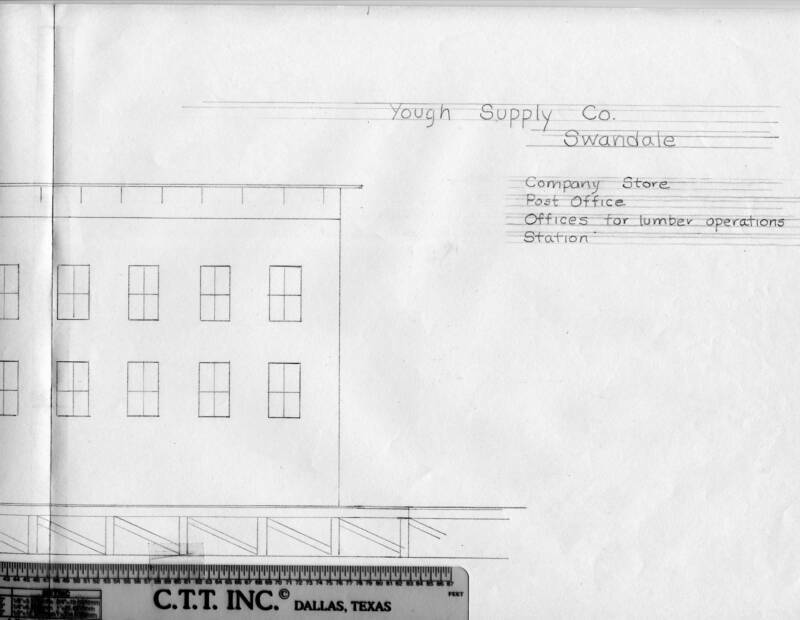 One of the biggest structures in Swandale was the Company Store. I'm not exactly sure when it was built but the photo to the right is dated circa-1929. It is the oldest photo I've seen. 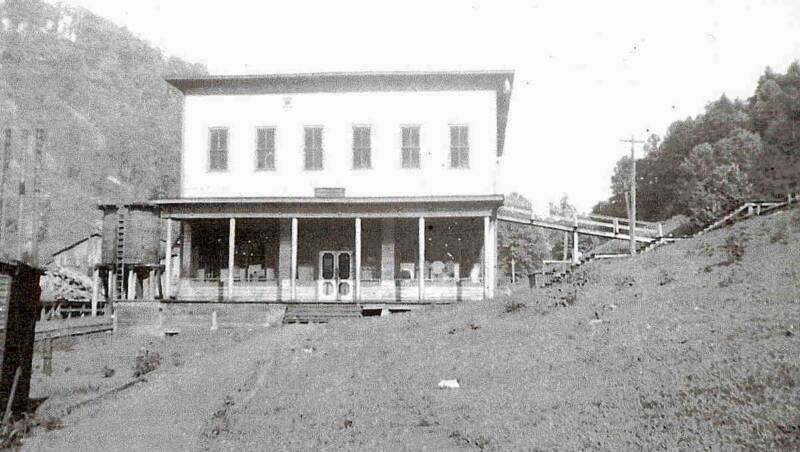 The store was a two-story affair that measured about 46 feet wide by 76 feet long. 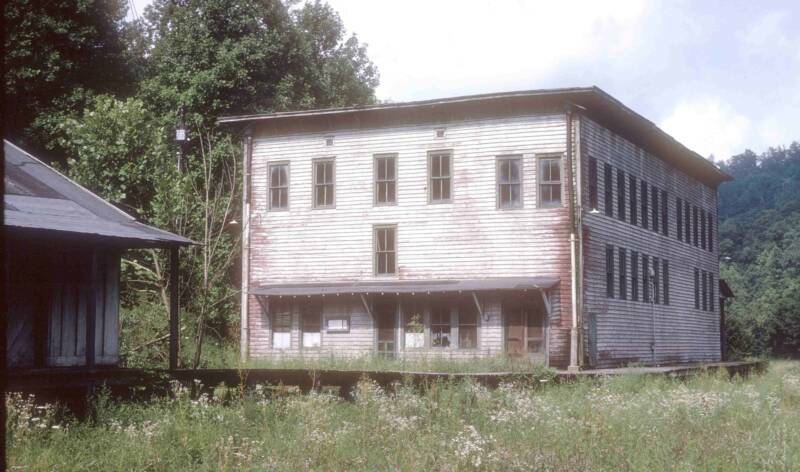 At one point it contained not only the store but company land offices, the US Post Office and a doctor's office. 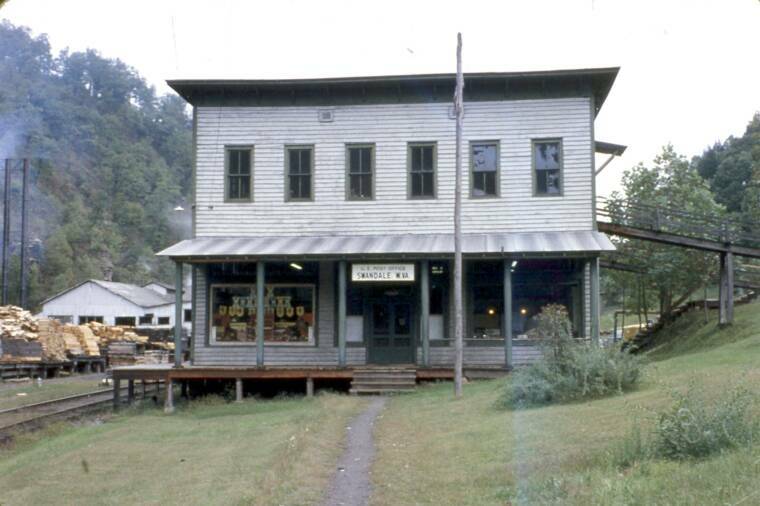 Patsy says that the doctor's office was to the right at the top of the ramp and there was a lodge for club meetings on the left. Under the ramp was the door to the post office with company offices behind. On the second floor furniture was displayed for purchase as well as dishes and eventually caskets. 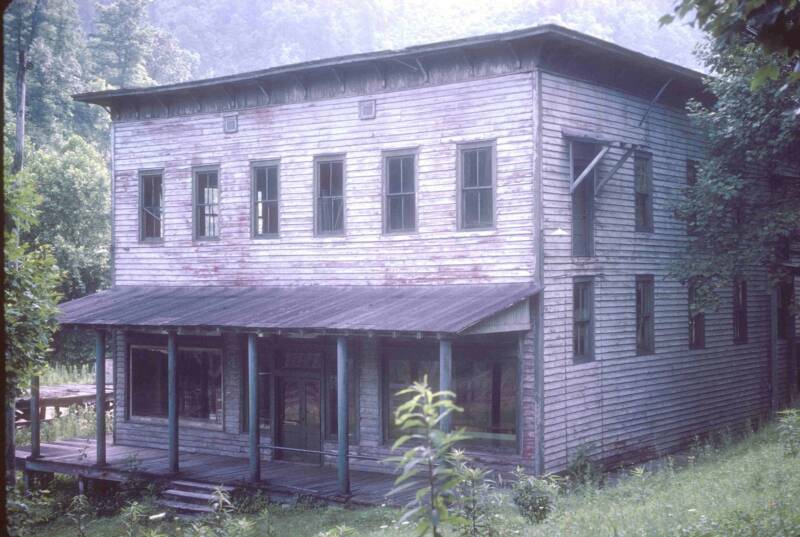 Note the wide front staircase and awnings in the photo to the left that are gone in later photos. There's a surprise in this photo...the water tank to the left of the store. These three photos show how the store sat close to the side of a hill and clearly show the forward location of the ramps, or in the case above, the door the ramp led to. This view shows the full side of the store. There was a wooden walkway along the side of the store that led to the storage shed (see photos below). 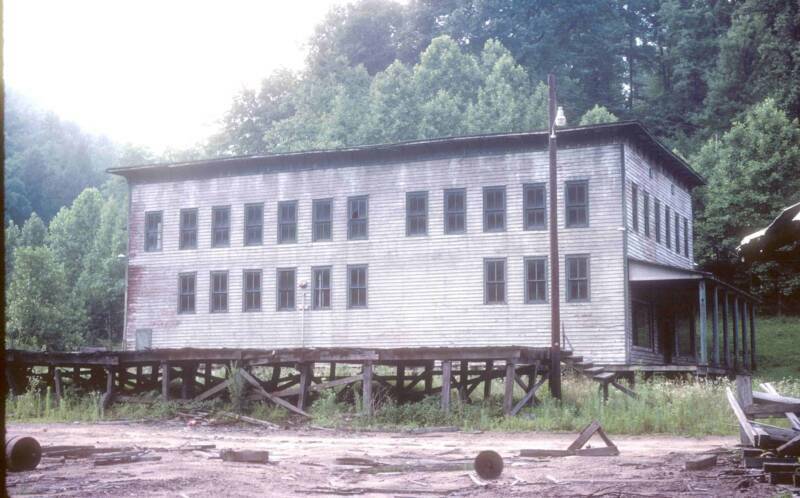 The deteriorating decking in the foreground is part of the sawmill. Sadly, there is nothing left standing of any of the structures at Swandale. This photo was taken standing on the foundation of the Company Store looking toward the track during the summer of 2007. The proximity of the structure to the track is obvious from the location of the speeders. 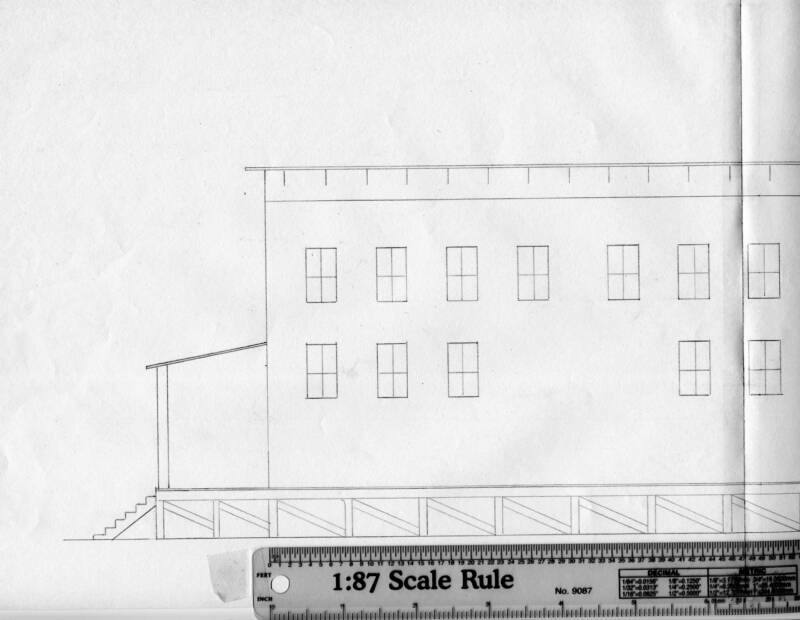 The storage shed measured 28 feet wide, including the covered dock by 90 feet long. Thanks to Dave for taking the measurements! Dave's three photos show all four sides of the structure. 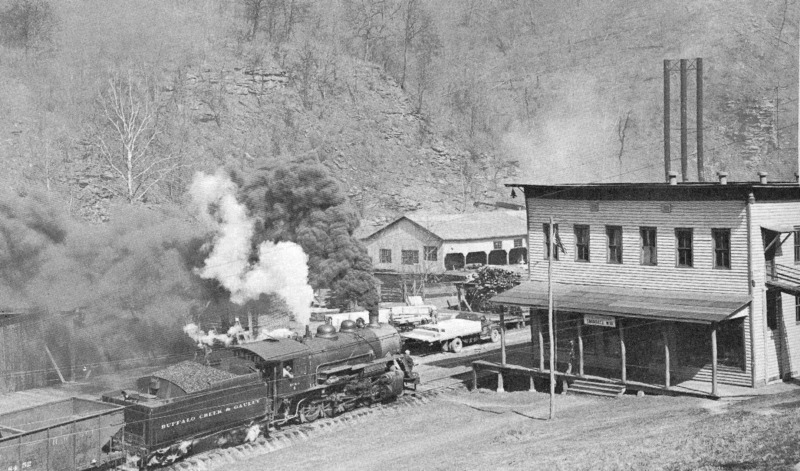 Also visible in the photo to the right is the sawdust conveyor extending from the sawmill wall and the ERC&L engine house, center. A special treat in this photo is the GP Plymouth diesel #20 just to the left of the engine house. 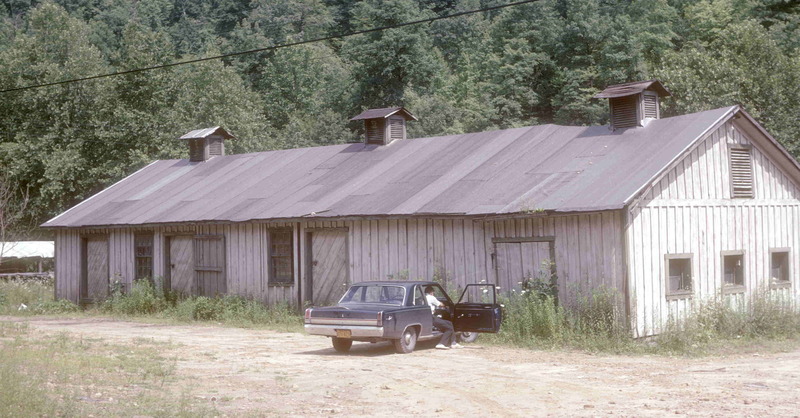 The series of photos below provide a pretty complete description of the company store and the storage building, known as the "feed house", that sat directly behind it. In the three pictures below a second ramp now goes to a forward door in addition to the one to the rearward door. Patsy Baughman explains that this shed, like a similar one next to the Dundon Store, was for the storage of feed for horses, chickens and cows. 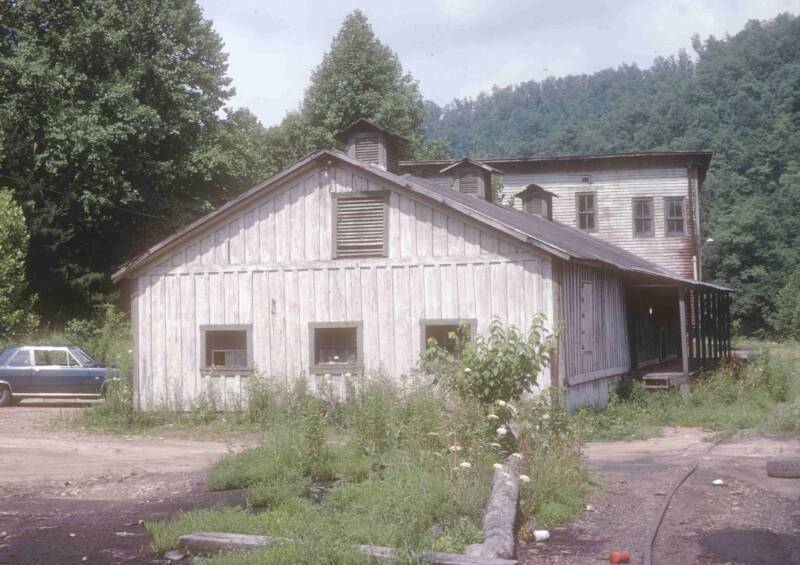 The photo shows the rear of the store and the corner of the "Feed House" (see below). Also just visible in the tall grass is the wooden walkway that connected the two buildings. It paralleled the track that ran to the engine house. 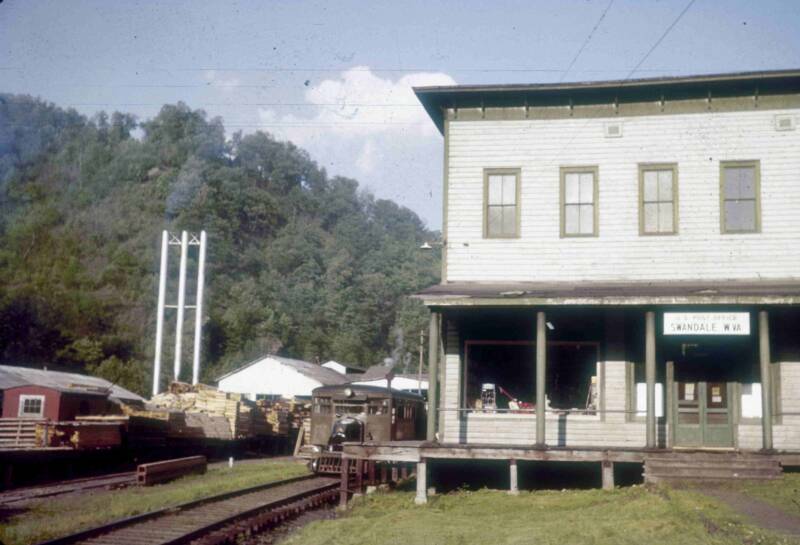 This nice overall view of the Company Store has good views of the ramp, the stairway coming down the hillside from the right, the nicely detailed front doors and the wooden water tank on the right. 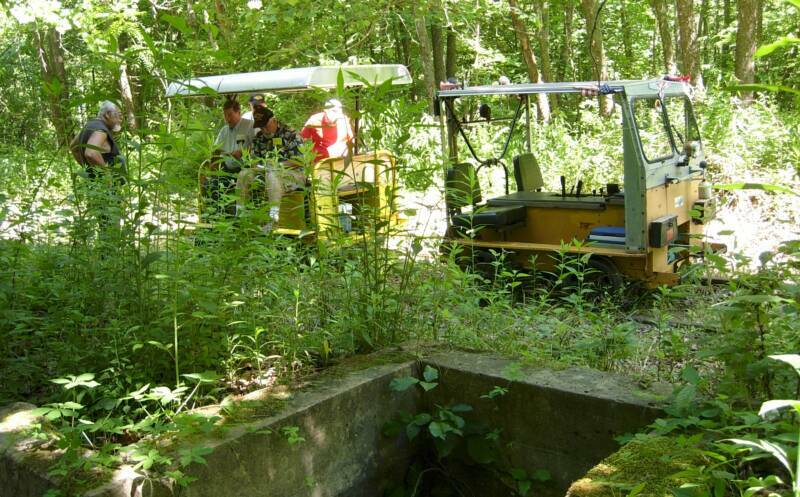 The sawmill is visible behind the tank. Elvin Frame offers some additional interesting information about the feed shed. Elvin says "the feed and storage building had an area at the end away from the store to keep ice. The room had about a 3-foot deep hole to store the ice in. A small dam was built across the Barren She branch up above the horse barn. Another dam was built up Whetstone Branch. I was told, Elvin says, they cut ice during the winter from them and put it in the 'ice room' for use by people. They probably brought ice from Charleston during the summer and fall seasons. Sawdust was put between each layer to keep it from melting." 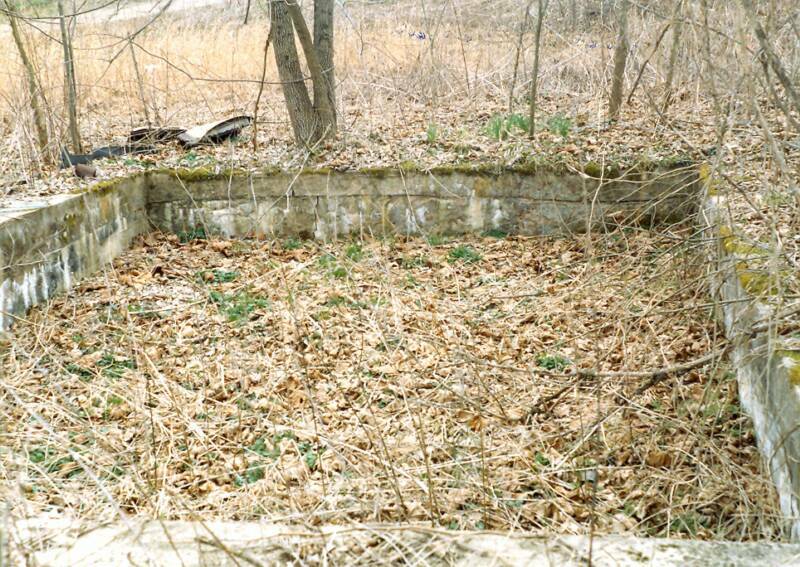 To make his point, Elvin has provided this photo of the ice house foundation. This photo was taken in March of 1990 and shows the depressed area in which the ice was placed. 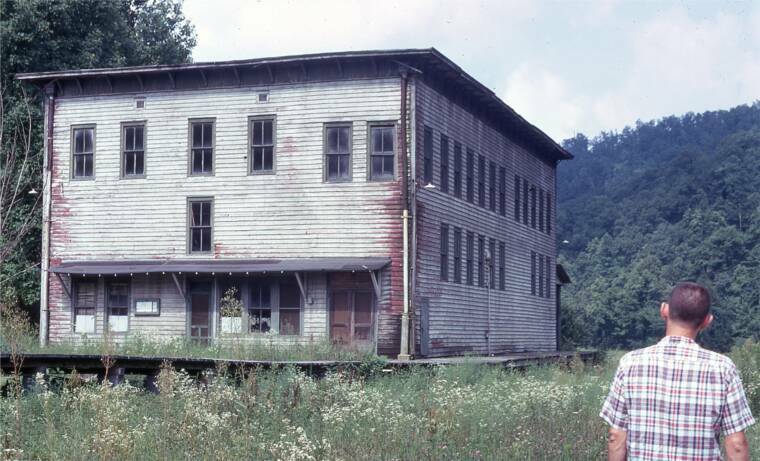 Dave Marquis has done some of the work for anyone interested in building a model of the Swandale Company Store. Shown here are 4-view line drawings Dave made of the structure. 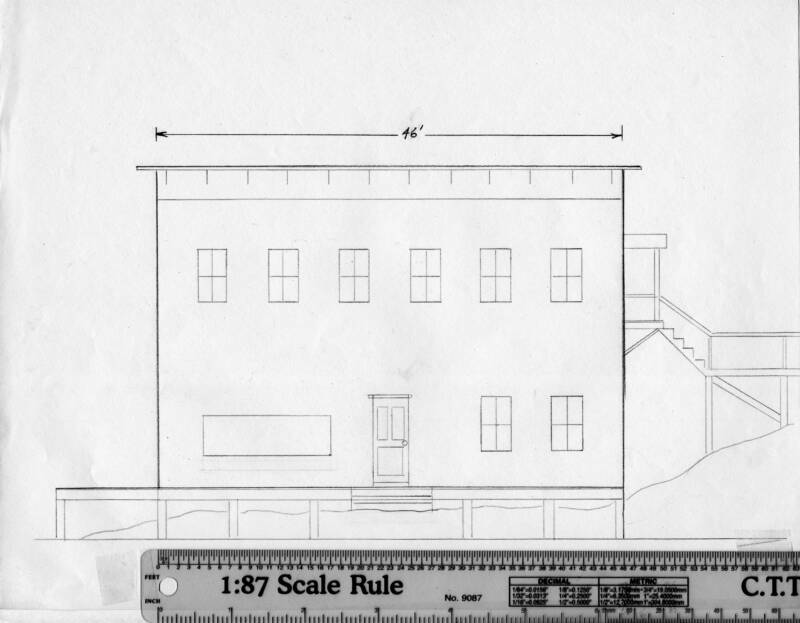 A 1:87 scale rule is laying on each drawing so dimensions can be determined. 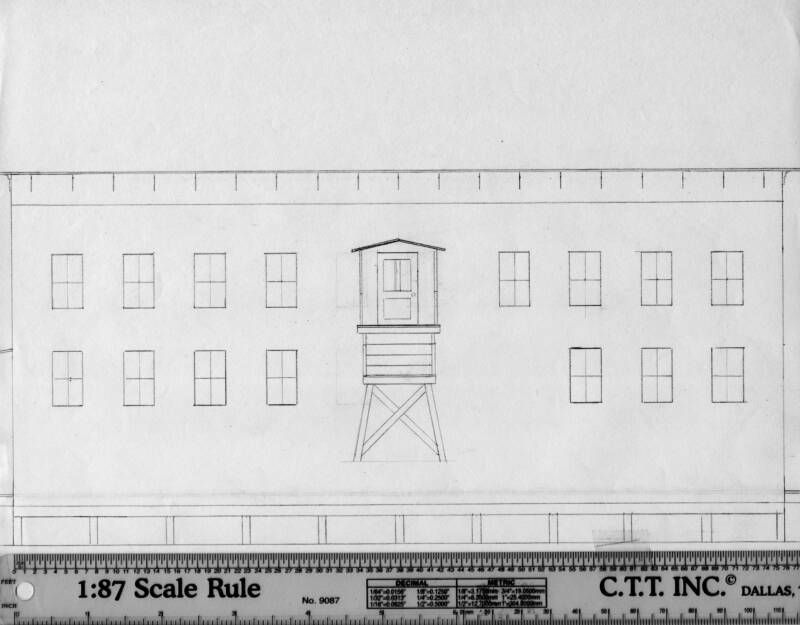 NOTE: Dave reversed the building left to right in the drawings to meet the need for a 'mirror-image' building on his own layout, the Chestnut Ridge & Laurel RR. 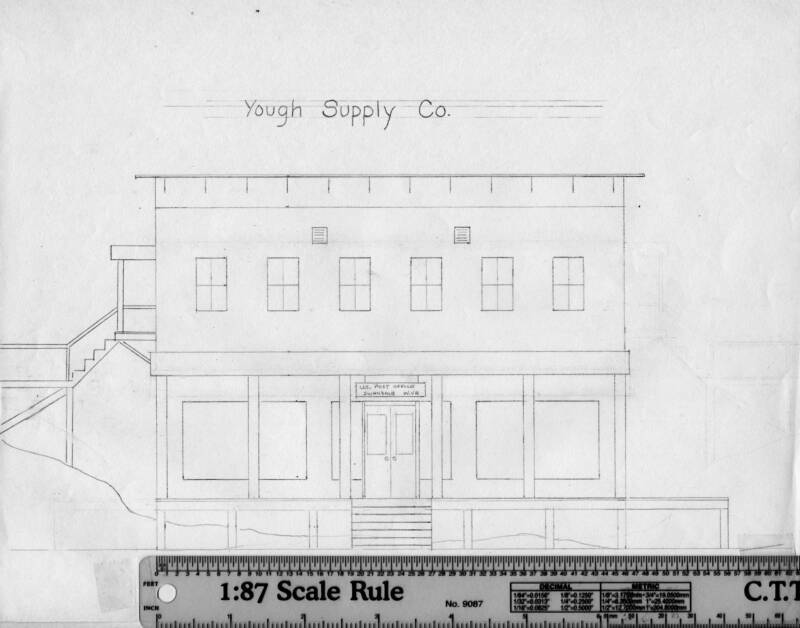 The name on the drawing "Yough Supply Co." is the name for use on his layout and does not represent any part of the prototype. Jerrold Murphy, who lived in Swandale many years, also rcalls that the doctor's office was up stairs accessible from the ramp. He does not recall exactly when the Scout room was opened (in the front corner) but it was converted from part of the upstairs of the store. The forward ramp was put in so the room could be accessed when the store was closed. Jerrold goes on, "It always had a distinctive smell, which to this day, seems to stick in my nose. There is no real way to describe it, but it seems to be a mixture of coca-cola, bologna, and floor oil. I remember that during the war years there was a pillar in the middle of the open area in front of the counters and itt had the required OPA sign on it. Not too many people nowadays remember, or ever knew, that during WWII prices were controlled by the government and OPA stood for, as best I can remember, Office of Price Administration. "The furniture area upstairs became a toyland during the Christmas season, at least to the extent that toys could be obtained during the war. "As you entered the store, the grocery section was on the left and the dry goods section on the right. There was a rolling ladder on that side that could be rolled along the length of the store to reach items on the higher shelves. The stairway to the upstairs was in the center of the back of the store. To the right of the stairway was the post office, and behind the post office window and mail box array was the company office." Patsy Baughman says she "remembers well when we school kids stood in line on the ramp to the doctor's office to get our chicken pox innoculation and I can remember the interior of the office lined with shelves with large brown bottles of medicines and white jars of slaves and ointments. The medicines were transferred into small bottles and tiny envelopes for the pills for patients to take home. Therefore, there was no drug store. Anyone who went to Dr. Harper, Dr. Strickland and later Dr. Brown will remember the little gray pills - pronounced "calcidine" for colds and bronchitis and the merthiolate, iodine and others for cuts and wounds." This fascinating and unusual photo was taken in June 1964 by Larry Fellure. It is obviously taken from inside the company store. Visible in the foreground are ice cream freezers, racks for bagged snacks and the tops of soda bottles. Engine #4 has the caboose, a couple of chip hoppers and at least two box cars in tow. Sammy Burkhammer is riding the footboard. 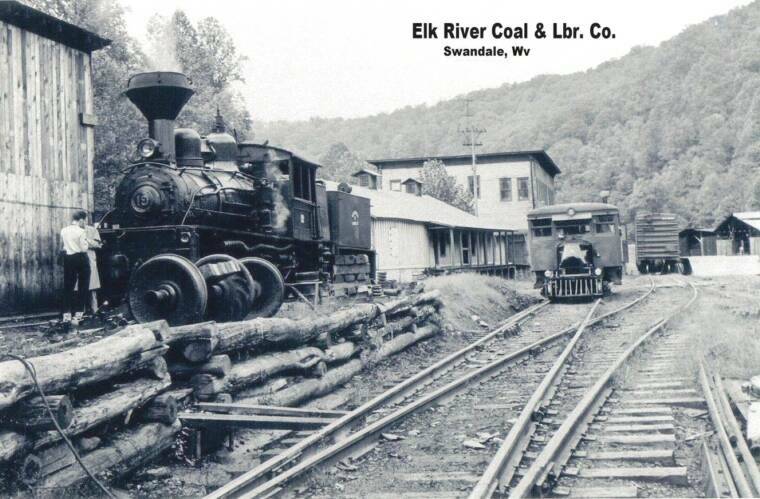 By this time the mine had closed and trains only ran as far as Swandale. Since there was no place to turn the engines here, they ran tender-first back to Dundon and the interchange. 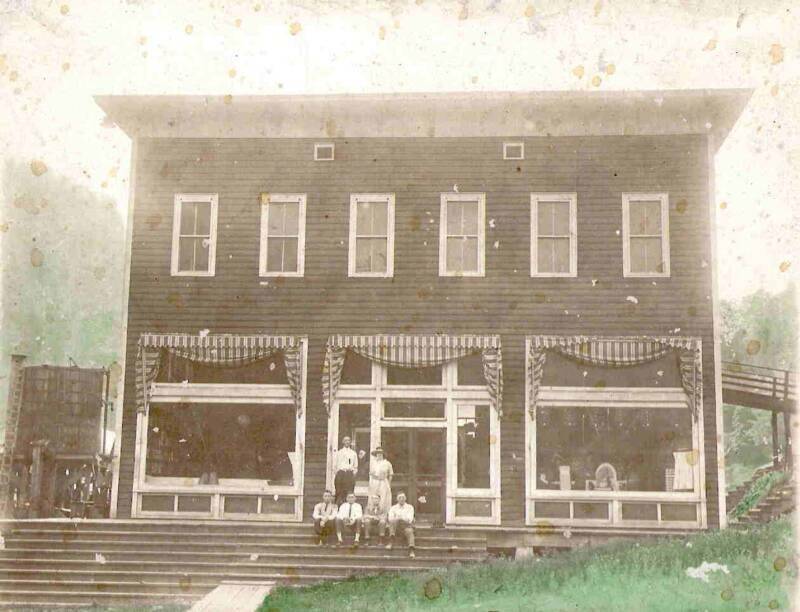 Patsy reports that sometime in the 1930's the store became a member of the IGA (Independent Grocery Association) and the words "IGA Stores" appeared on the sign on the front of the store. This interesting photo is from the Loretta Johnson Sample collection. It shows a good view of the loading dock on the feed storage building but also the interesting timber wall next to the engine house, giving a clear indication of how far above the main line the engine house sat. The two horizontal beams running between the rails and the timber wall look like the base for a small 'bridge' leading to steps up to the engine house. The Shay #19 must be undergoing some quick repairs...it looks like there's a fire in the boiler while at the same time the tender is sitting on a pile of ties! 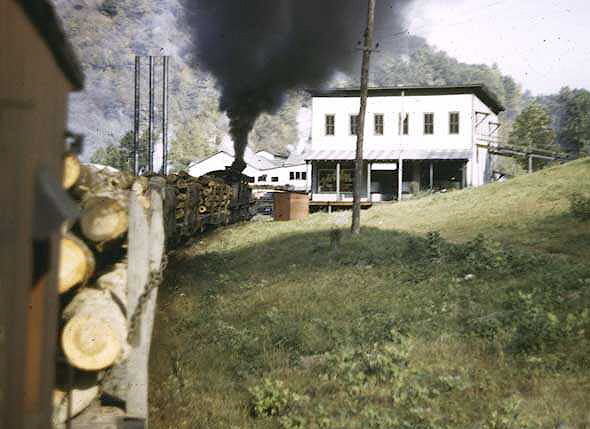 Also of note is the boxcar sitting at the loading dock of the sawmill. Note, too, that there is a spike in every tieplate, at least on the turnout. Perhaps the photographer arrived in Motor A. While undated, this photo was taken after the sale of the logging operation to W.M. Ritter, as evidenced by the lettering on #19's tender. 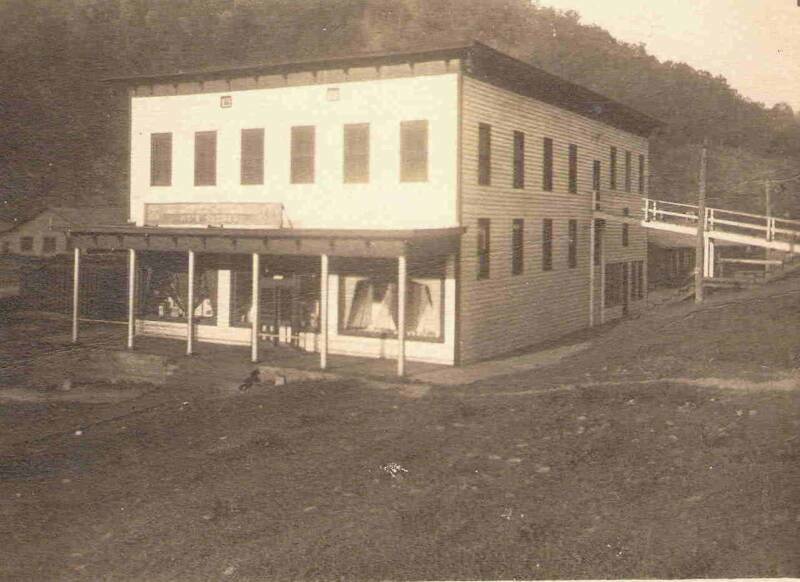 While very similar to the photo directly above it, this one shows the full width of the store as well as the two ramps to the hillside to the right side of the photo. Bob Rhodes says that the second ramp that went to the Boy Scout room was built in 1949. Jay Rhodes was the store manager up until his death in May 1950. Obviously the sawmill is busy, based on the stacks of fresh lumber. Notice the small dirt path leading to the steps of the store. Enlarge the photo and enjoy all that's going on inside the windows. 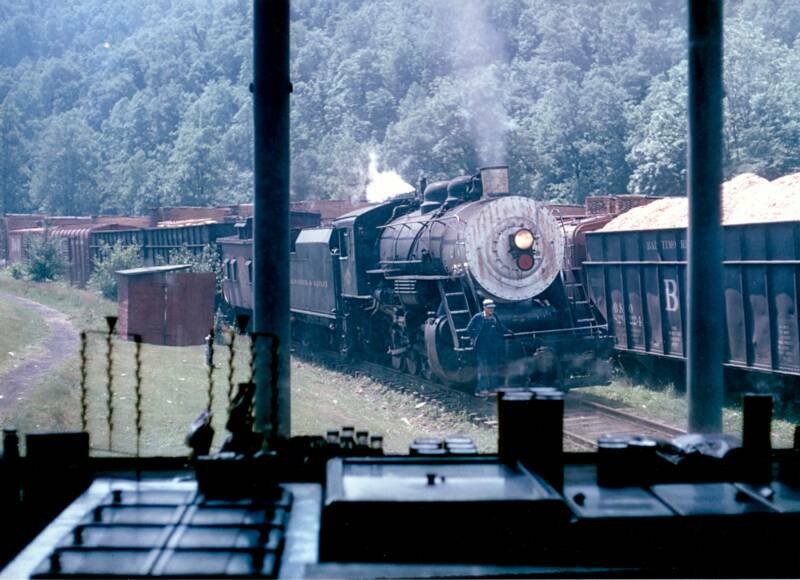 Back in July 1969, two railfans visted the then abandoned BC&G. One was David Marquis and the other was Richard Bradley. They took many similar slides. The detail of the corner of the Swandale store, above, was taken by Richard, as was the one of the entire structure to the right. In fact, that's David Marquis in the photo. Both photos clearly show the prior red paint the structure wore. I think it's interesting that this picture and the one above it taken exactly 40 years ago are now together on the same page of this website!